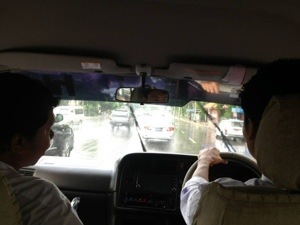 My trip to Myanmar coincided with the monsoon, the rainyrainyrainy season. On the way in from the airport on the first day the rain was pretty impressive, but it had finished by the time we left the bus, and the world was mainly dry by the time we went out. Natpwitay was dry apart from some torrential downpours. The biggest problem was avoiding slipping over at the edges between indoors and carpet, and outdoors and ankle-break land. They were well prepared for rain in the convention center, with crews ready to rapidly sweep away the aquaplane as it layered up. The last day though gave me many more insights into real rain. Imagine many people with umbrellas, battling through narrow streets, all around the same low Asian height (for now, until the next generation benefits from better nutrition possibly). The street stalls have this down to a fine art, with plastic sheets coming out about two minutes before the rain really comes down. They even have different levels of rain protection, depending on the product. Crossing the streets is hard in many places. 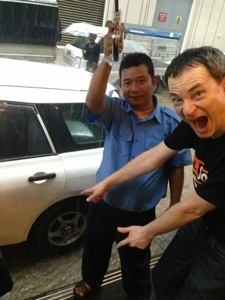 I had often wondered why many people in Yangon had plastic flipflops rather than my sophisticated sneakers and socks. It turns out that flipflops allow you to wade through super-high waters that build up at intersections. Crossing the streets barefooted is not a great idea, as you can see nothing below. Crossing the streets with shoes on is either a hopeful game of Frogger (for those old enough to remember the first computer games), eying dryish spots to balance on, or a mini-run and a long jump to clear the kerbside wading pool. I now think that I will get some waterproofed sandals of some sort for my next visit during the rainy season. As it happened, I came back pretty soaked, pulled some fresh clothes from my luggage and repacked for a dry trip. But in my mind, I will never forget the rain in Myanmar. Awesome.